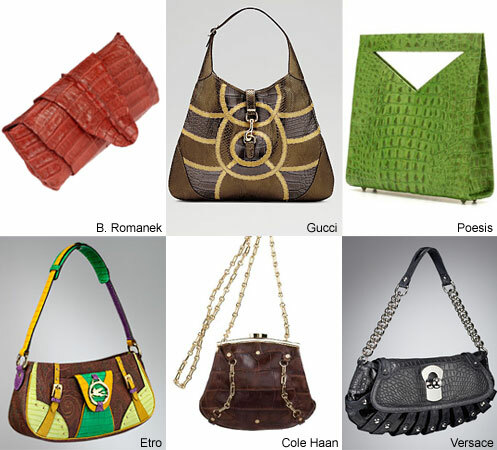 From old money to new luxury, crocodile handbags have always maintained their glamour. The most popular styles refrain from classic styling to look more modern and edgy. Take, for instance, the Rockstar Clutch from B. Romanek. Bucking trends and predicable handbag designs, the designer wrapped a crocodile skin around itself several times to create a glamorous clutch. This novel design is sure to be an everyday classic, and can be paired with both casual and couture clothes. Plunk down $1,950 for a bag that will outlast trends and preserve its popularity for years to come. Gucci never fails in creating luxury handbags with luxe materials. From their Fall/Winter 2006 Collection, comes the Bouvier Large Hobo with alternating grey and gold crocodile patchwork. Luxury doesn’t come cheap though – the bag is priced at $10,900. A cheaper but equally glamorous alternative to Gucci’s high priced hobo is the Quadra by Poesis. Glazed crocodile–embossed calfskin is the essence of this geometric tote, available in four candy colors. Punctuated by sharp lines, this structured tote is moderately priced at $160. Etro never fails to tantalize the eyes. The Arnica Zip Crescent Bag has Etro’s trademark paisley print coated canvas accompanied by shockingly bright combinations of colored crocodile–embossed leather. The green, yellow and purple leather trim is sure to catch your eye. For a throwback to vintage times, check out the Cole Haan Crossbody Minibag from the Paige Croc Print Collection. This adorable wallet–like bag maintains a classic feel with its lengthy chain strap, snaking its way through the front of the bag and over the polished crocodile embossed leather body. It may be worth the $718 price tag since it can get you double duty. Carry it as a clutch to carry for a night on the town, and wear it over the body for the workday. From north to south and east to west, one thing we can all agree on is that this is one haute bag. The Versace East/West Clutch offers a stamped croc leather basket, peek–a–boo patent leather, a chain strap, and a flap closure, all for $2,305.